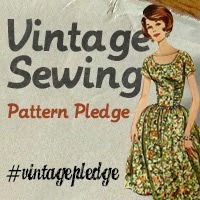 My Shoulder still isn’t quite up to long hours of dress making but I do hope to have a couple of skirts for you to look at soon. 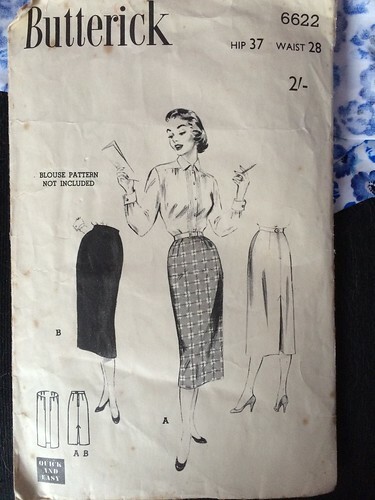 Slim skirt needs only one yard 54″ fabric-sews in a Jiffy. Skirt has single back seam, deep inverted pleat, back slide fastener closing. Make the skirt with soft unpressed pleats(A), or darts (B) under lining the waistband. Slim Skirt in three versions. Views (A) & (C) can be made from 1 yard of 54″ fabric. (A) Mock wrap-around version buttons at side back. (B) Double-buttoned, floating panel is back. (C) Back slit. 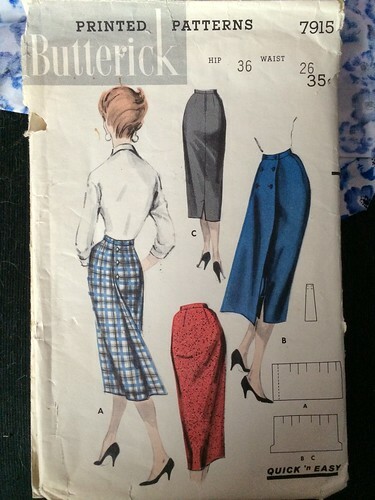 Posted on 08/07/2014, in Butterick 6622, Butterick 7915 and tagged 1950, Butterick 6622, Butterick 7915, vintage dressmaking. Bookmark the permalink. Leave a comment.